Fieldwork takes you and your mobile workers places without a data connection, but that shouldn’t stop you from using your GIS data. You can create a scene without an Internet connection, and you can use it on your device in the field. You can use a custom app built with AppStudio for ArcGIS or ArcGIS Runtime SDK. Taking data offline often requires preprocessing. This workflow explains how to create tile packages as elevation sources for use in the Create Mobile Scene Package geoprocessing tool. However, it can also be used to create tile packages from aerial imagery. Aerial images that reference raster datasets are supported as input to the Create Mobile Scene Package tool. It is recommended that aerial imagery be in tile package format to avoid the overhead of having the ArcGIS Runtime SDK app unpack the raster dataset on the mobile device. The data used in this tutorial is available as a project package that can be downloaded from ArcGIS Online through ArcGIS Pro. Open a new instance of ArcGIS Pro. From the ArcGIS Pro start page, click Open another project . Click the All Portal filter and search for Make Offline Scene example. Select the Make Offline Scene project package and click OK. The project downloads and opens two scenes: WGS84 and WebMercatorAuxiliarySphere. Choose Option 1 or Option 2 below, depending on whether the mobile scene package is intended for a Global Scene in the WGS84 coordinate system or a local scene in the Web Mercator Auxiliary Sphere coordinate system. If this project is for ArcGIS Runtime SDK follow option 2 as ArcGIS Runtime SDK only supports global scenes. 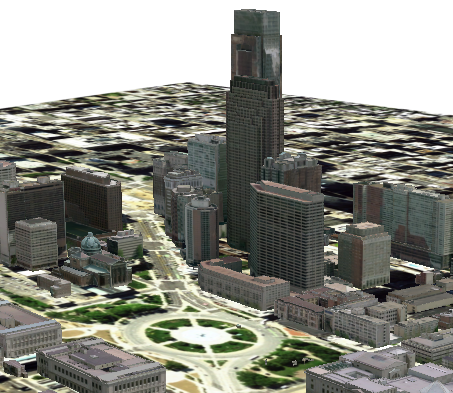 ArcGIS Runtime SDK only supports ground elevation sources that reference a tile package. To take the scene offline, use the Manage Tile Cache and Export Tile Cache tools to create the tile package. Ensure that WebMercatorAuxiliarySphere is the active scene. On the Analysis tab, click the Tools button. Specify a Cache location using the browse button . Type Elevation Cache Web Mercator for Cache Name. Select Recreate all tiles for Manage Mode. Select DEM for Input Data Source. Select Elevation tiling scheme for Input tiling scheme. If the tile package is for an aerial image, select ArcGIS Online tiling scheme. Use the default number of scales. If you do adjust the scales, ensure that the Minimum Cached Scale and Maximum Cached Scale values are adjusted as well. The cache is created in the cache location. If Elevation Cache Web Mercator was not added to the scene in the previous step, add Elevation Cache Web Mercator to the scene from the Cache location. Select Elevation Cache Web Mercator for Input Tile Cache. Specify a folder for Output Location using the browse button . Type GroundElevationWebMercator for Output Tile Cache Name. Select Tile Package for Export Cache As. Use the default values for the other parameters. A tile package is created in the output location. This workflow requires that you generate a tiling scheme file, since the Manage Tile Cache tool does not create a cache with LERC compression in any coordinate system other than WGS 1984 Web Mercator Auxiliary Sphere. This workflow is for the WGS84 (WKID 4326) coordinate system but can be used for any projected or geographic coordinate system. Ensure that WGS84 is the active scene. Type WGS84TilingScheme for Output Tiling Scheme. The tiling scheme will be written to the project folder unless specified otherwise. Ensure New is selected for Generation Method. Type 17 for Number of Scales. You can adjust this value, depending on extent and size, if you're using other data. The value of 17 is used because it matches the number of scales in the Esri Terrain 3D service. Expand Advanced Options and select LERC compression for Tile Format. If this tile package is for aerial imagery, use Mixed compression (the default). Type Elevation Cache WGS84 for Cache Name. Select Import Scheme for Input tiling scheme. Click the browse button and browse to the tiling scheme created in the previous step. Click Select All to select all the scales. This can be adjusted if you're using your own data. If you do adjust the scales, ensure that the Minimum Cached Scale and Maximum Cached Scale values are adjusted as well. Use 250000000 for Minimum Cached Scale. The cache is created in the cache location and added to the scene. If Elevation Cache WGS84 was not added to the scene in the previous step, add Elevation Cache WGS84 to the scene from the Cache location. Select Elevation Cache WGS84 for Input Tile Cache. Select the project folder or any folder for Output Location using the browse dialog . Enter GroundElevationWGS84 for Output Tile Cache Name. Now that the data has been prepared, you'll ensure that the scene is ready for input to the Create Mobile Scene Package tool. Remove the DEM raster and any other rasters from the Contents pane that were created in the previous steps. Add the tile package to the ground elevation surface. On the Map tab, in the Layer group, select Add Data > Add Elevation Source . Browse to the recently created tile package and select it to add it as the elevation source. The tile package is added as the ground elevation source. You may need to refresh the workspace to see tile package. Once the scene has been prepared, you're ready to use the Create Mobile Scene Package tool. Click the Input Scene drop-down menu and select WGS84 or WebMercatorAuxiliarySphere. Specify a location and file name for Output File using the browse button . Use the default values for Input Locator, Area of Interest, Extent, and Clip Features. Specify Downtown Philadelphia for Title. Specify Downtown Philadelphia Offline Scene for Summary and Description. Specify philly, mspk, and offline for Tags. A mobile scene package is created that can be shared across the ArcGIS platform. The mobile scene package can be shared to ArcGIS Online or Portal for ArcGIS 10.7 or later for use in an ArcGIS Runtime SDK app.